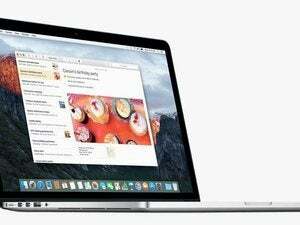 The browser in OS X 10.11 El Capitan has new features that you'll use right away. Safari’s major overhaul occurred when Yosemite was released last year. By comparison, the changes to Safari are just a few, but they will have an immediate effect on how you browse the web. Let's take a closer look at those changes. This feature alone is worth upgrading to El Capitan. Whenever you’re in Safari, there’s a very good chance that you have multiple tabs open. And many websites auto-play media (yes, like Macworld), so you can end up with sound coming from a tab you aren’t currently looking at. The problem is trying to find which tab the sound is coming from so you can mute the audio. In Safari 9, tabs with audio playing show a sound icon in the tab. This makes it easy to spot where the audio is coming from, but Apple goes a bit further. Click the sound icon and it mutes that tab. Click on the sound icon and you can mute that specific tab or all the other open tabs. If you click and hold on the sound icon, a contextual menu appears, and you have the option to mute all of the other tabs in Safari. If you’re watching a video on one page and audio starts playing from another, you can just use the contextual menu on the current page to mute all the others. The contextual menu also shows a list of the tabs with sound. You can select one from the list and Safari will put that tab front and center. We all have websites that we visit all the time. Pinned sites give you a quick way to get to those sites with fresh content. The Pinned Site that’s currently showing in the browser will have a color icon, while the other icons are greyed out. To remove a Pinned Site, click on the pinned icon to open the page, and then select Window > Unpin Tab. You can also right-click on the pinned icon and select Unpin Tab. What makes Pinned Sites different from using a bookmark in the Favorites Bar is that Pinned Sites are updated in the background, so they’ll always have the latest content. With Google’s Chromecast, you can stream web video in Chrome on a Mac to a Chromecast-equipped TV. It works easily. AirPlay support in Safari 9 brings this features to the Apple TV. Compatible videos will show an AirPlay icon; click on it, select an Apple TV, and the video in Safari will play on the TV, without your having to mirror your Mac’s entire screen. Using AirPlay, you’ll be able to play compatible videos from your Mac to an Apple TV. Most people don’t activate Safari’s Develop menu. It’s for web developers, so it would only confuse most users. It does offer interesting and useful tools, and you can activate it in Safari’s preferences; there’s a checkbox to show the Develop menu in Preferences > Advanced. The new Responsive Design Mode lets you preview a website for different iOS devices and resolutions. The Develop menu in Safari 9 has a new selection called Responsive Design Mode that web developers and designers will love. When you activate it, you can use it to see how a site will look on different iOS devices and screen resolutions. Click on one of the settings at the top, and you see a preview of the site below. The Develop menu has two other new selections: Disable Cross-Origin Restrictions and Treat SHA-1 Certificates as Insecure. Pressing Command-1, Command-2, Command-3, etc., on the keyboard now corresponds to the tabs in the Tab bar instead of the bookmarks in the Favorites Bar—this includes any Pinned Sites. For example, if you have two Pinned Sites and one other webpage open, pressing Command-1 opens the first Pinned Site, Command-2 opens the second Pinned Site, and Command-3 navigates to that open webpage. The keyboard shortcuts for the Favorites Bar are still available, but now it’s Command-Option-1, Command-Option-2, Command-Option-3, etc. To me, it makes more sense to leave the Favorites Bar keyboard shortcuts as they are in Safari 8, and then implement the Command-Option-number combination for the tabs, since it’s new. If you used these keyboard shortcuts, you’ll be in for a relearning period. Safari 9 has a little tweak to the UI for activating auto update for installed extensions. Apple made a change to the way you turn on auto update for installed extensions. 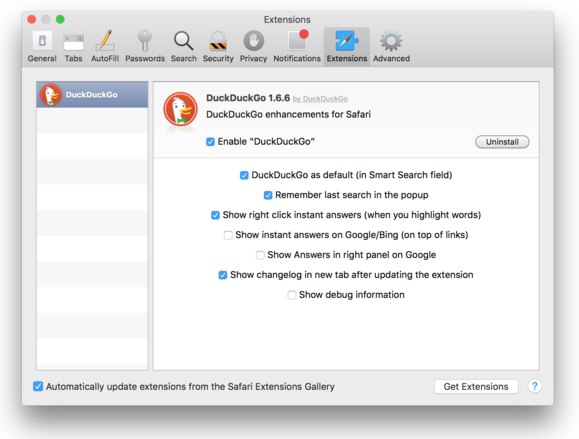 In Preferences > Extensions there is now a checkbox for automatically updating extensions from the Safari Extensions Gallery. The previous way involved an Updates button at the bottom of the list of extensions. When you clicked the button, a checkbox appeared to let you activate auto update. Lastly, the View menu has a new Show Sidebar selection. Editors note: This article was first published using the public beta of El Capitan. It has been updated and checked using the El Capitan released version.